For years my sisters and I have been going to see Feri for all of our aesthetic woes. It takes courage to put your skin and hair in someone else's care, especially when cleanliness and professionalism are crucial. I always feel extremely comfortable around Feri regardless of which treatment I'm getting done. Not once have I been disappointed in my results, seeing as how she listens carefully to all requests and knows how to arch brows like none other. And let me just say, this lovely lady turns everyone's woes into beautiful, (near) painless masterpieces. "Before" and "after" differences are hard to see, but much shaping was done. And our nail colours look so pretty together! Big thanks to Elena for the pics. For the threading process, Feri asks you to gently pull the skin taut, which you can see in the photos to the right. She uses thin thread twisted into a coil to carefully pull out the hairs when spun. This is an acquired skill, which you don't want to trust just "anyone" with. Eyebrow hairs are some of the most delicate on the body, and once the roots have been damaged, it's hard for them to grow back the exact same. Moral of the story: don't over-pluck! 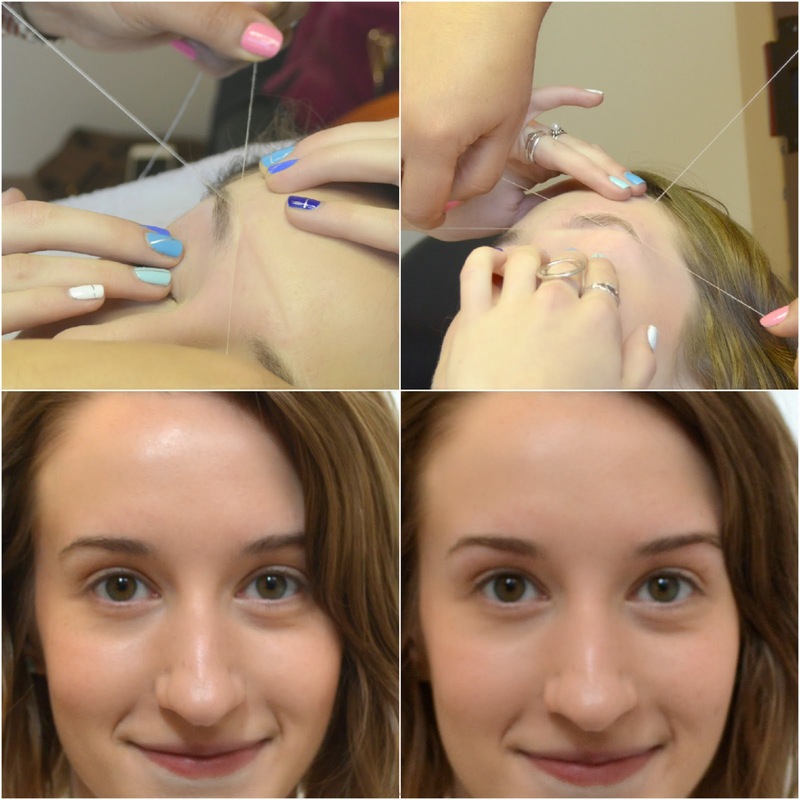 I prefer threading over waxing because even though it is slightly more painful, threading will take out all hairs regardless of their thickness. Not only does waxing pull the skin and cause more wrinkles overtime, I find that the results aren't as long-lasting since many hairs can get left out if they are too thin. I also wear little makeup to my appointment to make things easier. After the threading is complete, Feri cleans and conditions the area. I then leave my brow area alone until I wash my face that night. I make sure to do a gentle yet deep clean using my Clarisonic Mia and Froosh Go Deep cleanser, then follow up with Thayer's Rose Witch Hazel (by her request) and some Paula's Choice 2% BHA liquid, which I have recently been loving. I find that it is gentle enough for my sensitive skin, and really helps eliminate the opened follicles from collecting dirt/oil and becoming blocked. I also pop a Tylenol 20mins before my appointment to keep my skin from getting too red and irritated. 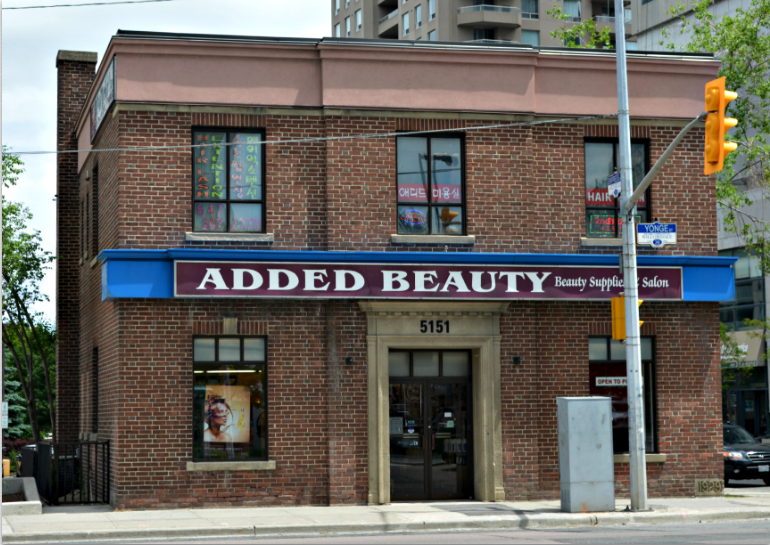 The Added Beauty salon is at 5151 Yonge St. in North York, right on the north-east corner of Yonge and Empress, which is directly outside of North York Centre subway station. When visiting the salon, remember to use the side door off of Empress, not Yonge, since you'll want to go upstairs. She is currently offering a discounted rate of $15 for both brow and upper lip threading, all in, cash only. Brows only is $12 cash. She also offers manicure, pedicure, body waxing, facials and more. "Like" her new Facebook page here to stay in the loop! Believe me, you'll be a client for life once you experience Feri's professional and affordable aesthetic services. Keep those brows in check!